The Micro1401-3 is a low cost, versatile data acquisition unit. The on-board processor with high speed memory is optimised for real time processing, free from the constraints of the host computer operating system. Fast and accurate sampling coupled with simultaneous output offers extensive on-line experimental control. 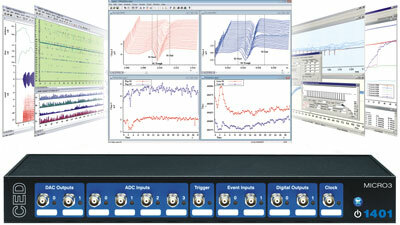 The Micro3 records waveform data, digital (event) and marker information and can simultaneously generate waveform and digital outputs in real-time for multi-tasking experimental control. It features high-speed waveform capture at rates up to 500kHz with 16-bit resolution. The 32-bit RISC processor allows complex on-line analysis while freeing time for the host computer to perform other tasks, such as data manipulation and further analysis.